Miranda is a fanciful and gold-colored pineapple table lamp. The lamp is built in the shape of a classic pineapple, which has been a classic symbol used in decorative arts and architecture, this modern table lamp conveys a sense of hospitality. 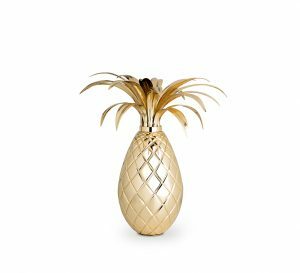 Finished in gold plated brass, it is named after Carmen Miranda, as she used to wear colorful and tropical fruits on her head. Miranda is a unique brass table lamp.